Seems like we can never get away from vancomyin. Always makes an appearance shortly after a fever is spawned in the hospital. Team Vanco barely nudged off its partner in crime in the last round. A comment from the blue-ribbon panel (BRP): “Vanc is bad, no, no now it is safe, no now its not so safe.” And another: “We used to give Vancomycin out like it was candy, of course that complacency would come back to bite us.” And another one: “This is probably a much bigger deal than we appreciate. Vancomycin a clear winner.” If you have ever seen mental status changes from cefepime you will never forget it. Next time you see a patient on cefepime, look at that creatinine. You don’t want to see this complication come up. The data truly linking vancomycin to renal toxicity is lacking. However, a recent retrospective analysis of critically ill patients in the UK demonstrated increased risk of nephrotoxicity in patients with higher serum vancomycin levels receiving intermittent infusion and anecdotally it seems to happen all too frequently (or is it guilty by association?). The ubiquitous nature of Vanco’s use propelled them to the next round to square off against HIVICK in a sweet 16 match-up. The battle of viral supremacy goes to HIVICK with a 5-2 victory. 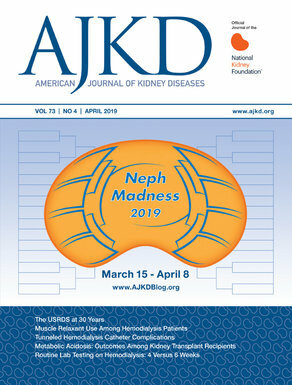 The BRP commented: “Polyoma is the new CMV so it won versus CMV, but polyoma, while a huge pain in the you know what for transplant nephrologists, is kinda boring, HIVICK wins for me.” A fan of BK polyoma countered: “Don’t count out BK. They are going to ride the coattails on enhanced immunosuppression.” HIV leading to HIVICK with its “complex” fastest 40 minutes of pressure packed defense proved too much for the insidious nature of polyoma BK virus. A scourge for transplant nephrologists who are grappling with how to deal with BK. The next battle for the “immune complexes” that are HIVICK is a sweet 16 match up against Team Vanco.